Name a Star in the News! Name a Star has been featured on various websites and publications. Oprah surprised a guest on the show with two Name a Star Memorial Stars. The Memorial Stars which were located in the Big Dipper were named in memory of her guest’s Mother and Sister. I recieved the Name a Star today. I will be giving this as a wedding gift to a wonderful couple that my husband works with. It is beautiful. The presentation is wonderful and the information booklet that came with it is presented so well that I would get this as a gift again for someone. Thank you again for being so prompt with delivery and the service is great. It will be a cherished gift for this couple for a lifetime…. Awesome certificate! Came out 100 times better than expected. Printed beautifully! I referred to the suggested sites to view the star and Google Earth generated a very beautiful picture of my Fiance’s star! I have no doubt, when I give this to her she’ll freak out! Thanks Tonya & Name A Star! Really appreciate it! Tonya, Just wanted to let you know how much I love the Twilight Sea Turtle. I bought this for my daughter, who had my first granddaughter, and she just loves it also. Thanks so much. Be sure to spread the word about how much I love this and am very pleased. I’ve shown my kit to some friends and they were a huge hit. I’m a customer for life! This is such a wonderful and unique tribute. Thanks so much for your services. I love Name a Star. This is my second time ordering a star. The first star was a memorial star for a hospice patient’s family. These two stars are for my granddaughters that are 5 and 8 and are 1700 miles away. I recommended your site to a friend that ordered a star for a stillborn infant and it meant so much to the parents. Thank you for such a awesome gift. I got my Name a Star portfolio in the mail today.. Wowzers, you guys are fast. Everything looks incredible. This is going to be such a special anniversary gift. Thank you so much for the amazing customer service. Here’s what Sherri S. has to say about our Star Naming Service on Foxnews.com Wednesday, January 14, 2004. “My nephew was just born premature on Dec. 11. The night he was born, the Big Dipper was out. That’s him. “Name a Star guaranteed our star would be located in a spot that would be easily seen – it’s in the Big Dipper. They give you this sheet with the constellation and it gives you the star exactly. I’m really bad [at locating stars] and I can find it”. Internet Gifts to the Rescue! We did not solicit their promotion of Name a Star. Name a Star is the best way to buy a star name! No se si me entiendes al escribirte en castellano, pero te escribo para agradecerte tu gran eficacia y buen trato.Estoy encantado con el pedido que te hice para mi madre y fue un magnifico regalo para ella. Le gusto mucho. El motivo de escribirte es para reconocerte que eres una gran profesional y que en todo momento has atendido perfectamente mi pedido. Antes de esto yo no estaba muy seguro de realizar compras por internet, pero ahora veo que con empresas serias y profesionales como tu es muy fiable. Gracias por hacer posible la ilusion de mi madre. Excellent communication, service and product. Tonya surpassed all expectations with her immediate responses to changes that were made after the order was placed. We now have a new star and a very happy 18th birthday recipient! great price, attractive portfolio, and no hassle ordering was just a perk! I got my packet today! And I wanted to personally thank you! What a wonderful job you do and what a great presentation you put together and send out. And as an extra bonus the star you picked for my brother was in the constellation Perseus which happens to be the main character of his favorite movie (Clash of the Titians). My mother is going to love this gift!! I can’t say enough great things – this is just absolutely great! Thank you so very much! An amazing company, with fantastic customer service and a perfect gift. You guys are awesome. Thanks a bunch!!!!!!!!!!!!!!!! I just wanted to let you know how impressed I am with you service. I placed an order from Spain via internet on Monday evening, and received the package in Spain on Wednesday morning! I looked at other sites that offered similar products and yours was the only one that offered the certificates in Spanish. I though I was buying something that nobody here would have, but since showing the package to my work colleagues this morning three of them have placed orders!! This is a wonderful site and will be recommended. married folk. My wife got a tattoo of our star name tattooed on her. Here is a wonderful recipe, tried and tested, for guys who do not like to cook on their wife’s birthday. Combine the following ingredients; A beautiful wife, a Jazz Duo, a great wine (optional), a 7 course dinner at a fine dining establishment along a lake at sunset, dessert for two brought to the table with one candle. Top off combined ingredients with the gift of a star [name] from Name a Star. This recipe, exactly followed, will be enjoyed by all, including wait staff, and will become one of the most memorable moments in their lives. I guarantee it! You cannot imagine the praise I have given your company [Name a Star] in my company. You have really displayed an extremely high level of customer, ‘hands-on’ service! Let me explain, I ordered two separete stars for Christmas, yours came immediately (as promised) no hassles and a wonderful package. You also continued to answer questions and inquiries as often as I requested. I wanted to try two different vendors due to the fact that I would like to order multiple (possibly up to 6) stars in the next 30 days. Ordering through two sources would give me the opportunity to realize the process and compare [star naming] product and service for my upcoming order. YOU WIN, HANDS DOWN!!! The other business, [competitor name removed], ooooohhhh! Terrible ordeal and awful experience. I would like to thank you for the service you provided me. I was all set to order my star from the [competitor name removed] when I decided to check out some other sites. After reviewing your site I was almost convinced to go with Name a Star but wanted to call first. The man I spoke with over the phone gave great customer service and was very helpful when I placed my order. I always somewhat question the honesty of phone orders or Internet orders but so far I have no complaints this time. I received my star faster than I expected and did not mind spending the small amount extra, It was actually worth it this time. I hope my husband enjoys this for his gift as much as I already do. The concept of looking up at the stars and knowing that one of them has been named for us is such a romantic ideal! I was actually going to go with a competer’s site but after reviewing this one decided to go with them. I felt at ease with the rep. that took my call who also took my phone order. Received my order faster than expected and pleased with the product. Your product is lovely compared to others who offer the same!! This was a terrific experience! I received exactly what was advertised and in two days as promised! They were very efficient and courteous in responding to my questions. The recipient found the gift very unique. Would definitely do this again! Reponse and information from direct telephone contact was EXCELLENT. I would order from the vendor again. Overall, the ease of ordering online was also excellent. Sav just filed a consumer report on Name a Starand gave your company a customer satisfaction rating of “Very Satisfied”. The consumer filed the following comments: I have e-mailed you separtely to let you know what experience I had this morning. I have ordered through you and just wanted you to know how much I appreciate your companies ethics and morals. Keep up the good work. Very good website and very good and personable customer phone service. I wish all companies were this good to deal with. My experience with my ordering over the phone was very satisfying. The person who helped me was very easy to understand and answered every question I had excellently. I am proud of my purchase and I thank you all. I and my fiance will be very happy to receive the star. I was very surprised with quality of service and how expedient they were. I called the day after ordering to check on order and it had already been shipped and was delivered as promised. I have no complaints, and would highly recommend…especially after seeing product. I just wanted to take a minute to say thank you for all of your help. Yesterday, I was able to give someone very special to me his birthday gift right on time, thanks to you. And his reaction to it was just what I’d hoped it would be. He was genuinely touched that I would do something like that for him, and he felt very loved and very special. I know that because his feelings were written all over his face, which meant more to me than his verbal thank you ever could have. Unfortunately, my order for this star package had all the makings of an “Oops! I meant well.” sort of gift. When I placed it, I hadn’t given you much in the way of lead time. But your turnaround time was fantastic! Then add in the fact that I made a typing error when I submitted my order, which I never caught until the next morning. By that time, my package had already been shipped. I e-mailed you regarding my problem, and you went out of your way to not only make sure that I got a corrected certificate, but you did it in my very short time frame. PLUS, I was pleasantly surprised to find out that I would only need to pay the shipping for the necessary correction. If you’d expected me to pay for a full second package, I would have found myself in the embarrassing situation of having to correct the certificate by hand myself. And that would have been far less than ideal. Your courtesy, cooperation, and prompt attention are appreciated more than you know. Thank you so much for helping me to give a very special man a very special gift that I know he will never forget. I would recommend your company in a heartbeat. My daughter told me about this site last night, and I immediately thought of my dear Mother. I wanted a Star named after her. After grabbing my first cup of coffee, here I am naming a star after her. Thank you so much! I want to pass along my deepest gratitude! I am a person who gets great joy out of giving gifts, and I must say this is by far the greatest gift I have even been able to give someone. I gave the newly named star to someone whom I love and care for deeply. 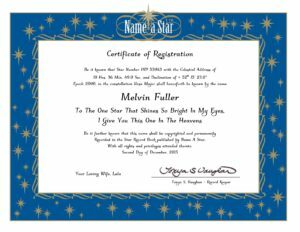 The name a star program and the versatility it has with choosing the name, and the comments you can put on the certificate gave me the ability to convey the EXACT feeling I wanted too. He now knows just how much he is loved and cared for by me, and I owe his surprise, and thankfulness to you! Without your wonderful service, I wouldn’t have been able to find a gift that delivered exactly what I wanted, and that was to convey love to someone in a very forever and big way. I don’t think you can get any bigger or luckier than having a star named in your honor. Keep up the great service! You have a new advertiser in me! I have told everyone about you, and the excellent service and product you provide. My order was perfect from the beginning! Service was excellent…. My gift arrived early because it was processed so fast from the company. It was a memorial star, so I was a little concerned about the early arrival, but everything was fine. The follow-up e-mail receipt and the UPS tracking e-mail are a nice touch. I knew where my gift was every step of the way. I was very pleased with the whole entire package and I think that the certificate looks absolutely wonderful. You guys did a great job putting it together. This is the greatest gift that I have ever been able to give anyone and I think my girlfriend will love it. I liked the fact that you have a tribute line so you can really make it personal. Although, the gift is completely fantastic I was even more impressed with how you treated me. … when it was sent in the mail and it bent, you sent me a new one. After all that when I was writing my name in the signature line the ink leaked and went all over my certificate, which was completely my fault and you are now sending me another one free of charge. I can’t believe how kind and caring you are and I am so pleased with the service you gave me and I can’t remember being treated so well. When you guys wrote ” Name a Star‘s primary purpose for doing this wonderful work is to bring joy. We love to share in the love expressed in theName a Star gift. Your satisfaction is guaranteed.” You went above and beyond all expectations and you continue to keep this true. As soon as I give this gift to my girlfriend you can count on me telling everyone who great you guys are and I will definitely be a repeat customer. Thank you so much! the quality was superb! The service was overnight by ups as promised and you made my fiance and i extremely happy!!! I will tell everyone about you guys! thanks again for your wonderful business!! !